18-24 stacked recently, rather than 10-12 tiled. Looking at the break even patch I've had in the last 800 games, this doesn't seem to have worked out. The thing is, I thought I was coping with this mass of volume, and think it could be a positive thing that I can reel off 100 SNGs in a 4 hour session. I think I've become too robotic in the Stars turbos. Especially playing so many tables. TTo try and freshen up my game I am going to return to Full Tilt. They have a maximum limit of 16 tables so I can't go too crazy. I will miss Table Ninja though :(, and similar software isn't yet up to scratch since the big FT update a few weeks ago. I just think I need a change of scenery after grinding so hard, and I kind of always intended to head back to Full Tilt after I'd built my bankroll up, because of their higher traffic in the $20+ range. Some game analysis is needed, have been SNG wizing a little, but not enough...so will vow to do some of this after each session. I've started watching some CardRunners videos I downloaded a few weeks ago, and I'm looking forward to the imminent launch of SNGNick.com, as I often follow Nick Rainey's Blog (see blogroll to the left), and he's effectively the role model (and roll model tbh) for what I'm trying to achieve in poker right now. I seem to have gotten into a good habit of at least 1 solid session a day, so I'm pleased with my recent work ethic, if not my results. 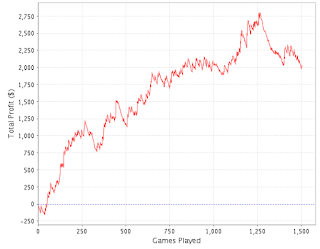 It seems I'm back and forth between Full Tilt and PokerStars whenever I hit a rough patch, but perhaps this isn't terrible if it helps freshen me up and keep me motivated. 2 Comments to "Change of scenery needed (again)..."
SNGNick is a sicko, God only knows how he puts in so much volume and is so consistant. I'm sure I read on his blog he was wanting red pro status as he could make $50k a month through rakeback alone! Lol yeah he's a sick man, that's crazy. Though if I was a red pro I would try and rake like crazy myself!!!!! !